Your smile is the way you greet the world. Have you always wanted a whiter, brighter smile? Are you unsure about what is and isn’t considered safe when it comes to tooth whitening? Whitening your teeth under the supervision of a dentist or dental hygienist is safe for your teeth and gums. Clinical studies as well as many years of experience have proven that whitening your teeth with carbamide or hydrogen peroxide under the supervision of a dental professional is a safe, effective and minimally invasive way to brighten your smile. 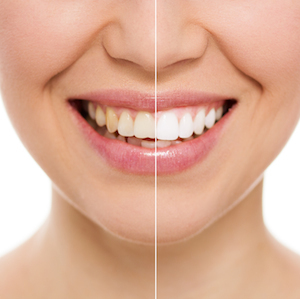 Whitening treatments are not recommended for those under 16 years of age and will produce varying results depending on the pre existing colour of your teeth. People with darkly stained, yellow or brown teeth frequently achieve better results than people with grey teeth. Teeth with multiple restorations, colourations, bands, splotches or spots due to fluorosis, tetracycline antibiotics or naturally light coloured teeth do not whiten as well, and may need several treatments or may not whiten at all. The quickest and most convenient way to whiten your teeth is an in-office treatment using the Zoom whitening system. Zoom is perhaps the most well known (as seen on TV shows like Extreme Makeover) and most often used in-office whitening treatment currently available. The Zoom system uses a hydrogen peroxide gel in combination with a specially designed lamp to achieve the maximum whitening results in the shortest possible time frame. At the end of your hour and a half appointment the Zoom system will usually have lightened your teeth by up to 8 shades (colours). All Zoom procedures completed by Medland Dental include a prescription strength home whitening maintenance kit to help you maintain your beautiful white smile. Home whitening with custom fitted trays is a perfect way to lighten your teeth over a 7 to 14 day period. Our on-site laboratory creates perfectly fitting trays custom made for your teeth that helps to prevent possible burns to the sensitive gum tissues if the whitening gel comes into contact with your gums. Your Medland Dental Dentist or Hygienist will select the best whitening gel formula, concentration and wear times to suit your specific needs such as tooth sensitivity and lifestyle. Over the years many different types of over the counter whitening products have also become available in supermarkets, pharmacies and on-line deal websites. These range from whitening toothpastes to do-it-yourself whitening kits. Whitening toothpastes contain abrasive ingredients designed to remove surface stains from your teeth. Most whitening toothpastes do not actually contain any peroxide and are therefore not effective at all in whitening teeth. In fact, the abrasive granules in whitening toothpastes can actually damage and wear away the surface of your tooth if used too frequently and can cause sensitivity. Over the counter whitening gels and kits contain very low concentrations of carbamide or hydrogen peroxide. Whilst these are the same ingredients used by dental professionals to whiten your teeth, the concentrations are often too low to produce any noticeable results. The concentration of peroxide found in these products is restricted by law as higher concentrations of these products can be damaging to your teeth and gums if not used correctly and whilst under the direction of a dental professional. In recent times whitening treatments have become available at beauty therapists and in some shopping malls. Whitening treatments performed by non-dental professionals can be dangerous for your teeth and gums and it is actually illegal for non-dental professionals to practice dentistry by completing whitening treatments. Chemical burns on gums, pain and damage to already weakened tooth structure can occur if peroxide is applied incorrectly or by an untrained person. Dentists and dental hygienists receive specific training in tooth whitening procedures and are able to diagnose potential problems that would prevent the whitening process from being completed safely. So are you ready for the whiter, brighter smile you have always wanted? Or do you have more questions? Talk to your Dentist or Hygienist about tooth whitening at your next appointment to find out which whitening treatment would best suit your individual needs.